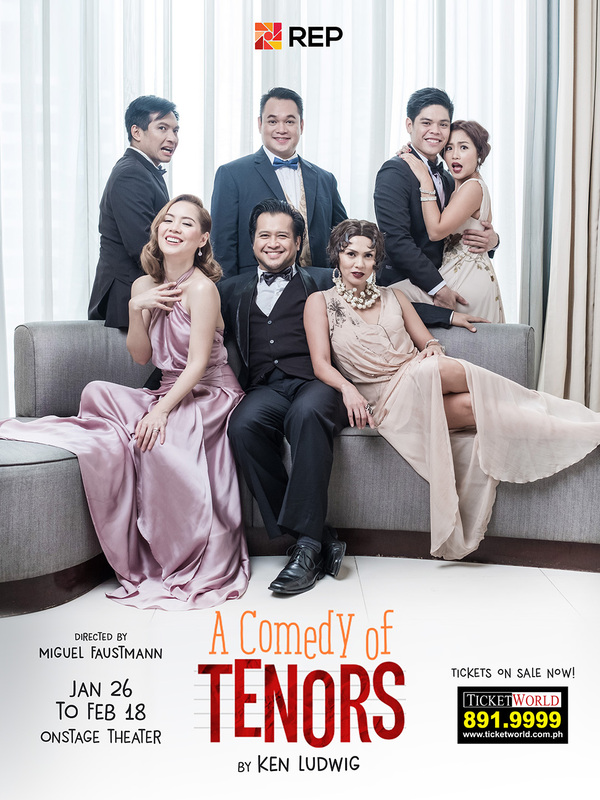 Kicking of the 81st season of Repertory Philippines is A Comedy of Tenors, a quirky little farce set in 1930's Paris. Now we've had a rather mixed experience Repertory's repeated attempts to perform comedies of this nature as sometimes the jokes just don't land well, mainly because of things feeling out of sync in terms of how the punchlines are delivered. But each new season is a new beginning an opportunity to hope for the best. 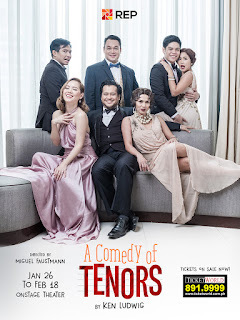 A Comedy of Tenors actually features a fairly large cast for a straight-up dramatic play and I was curious to see how things would all come together. The talent gathered for this show was a pretty diverse bunch that included some familiar faces we had encountered in many different places. The overall result was pretty positive, and this was considering we had opted to watch the show during its opening weekend. Normally I try to buffer a bit more time to give the cast more opportunities to figure out their rhythm together but I guess it wasn't quite neccessary in this case. Synopsis: A Comedy of Tenors is a comedic play written by Ken Ludwig. The Repertory Philippines staging was directed by Miguel Faustmann and was staged at the OnStage Theater at Greenbelt 1 in Makati City from 26 January to 18 February, 2018. Producer Henry Saunders (Jeremy Domingo) is impatiently waiting for the appearance of his star talent, the famous operatic tenor Tito (Lorenz Martinez) to appear at the Paris hotel room he had booked. While waiting he enlists the help of his former assistant and now also a tenor Max (Noel Rayos) to prep the room as they fuss over where Tito might be. Henry is staging a "Three Tenors" concert at Paris and has a lot riding on the success of this show. Eventually Tito arrives with his wife Maria (Issa Litton) and we experience their relationship dynamic which involves a lot of heated arguments. Tito is beginning to feel his age and is feeling threatented by rising talents like Carlo Nucci (Arman Ferrer). At the same time, he's in denial that his 25 year old daughter Mimi (Mica Pineda) is already of marrying age despite the prodding of his wife. As the news breaks that the other tenor has decided to withdraw from the show, things seemingly start to fall apart as the audience first finds out that Mimi is already seeing someone and the two had hidden themselves in the hotel room before the arrival of Tito and Maria. What I Liked: The play has a lot of great moments when the jokes whose setup points had been setup carefully earlier in the show really pay off that had me and my partner Tobie laughing wholeheartedly. The play has a lot of moments like this written into the narrative and I appreciate the thought that went into planing those reveals. The cast as well did a good job bringing these characters to life and driving things home. Special mention has to go out to Lorenz Martinez as his role demands a lot of physicality given his many entrances and exits at different points of the show. A good face always has moments like this but it never gets tiring when done right. I was also impressed with Issa Litton as Maria as she had a good share of the juicy comedic lines to play with and she delivered a lot of them to great effect. Side note also to the costume designer who picked some great outfits for the ladies, especially in the second act. Maria looked great all throughout and her bits even had a need for the clothing supporting physical comedy. But Tatiana Racon's dress in Act 2 was also quite elegant. What Could Have Been Better: Noel Rayos felt like the weaker link in the show and his performance left much to be desidered. He had a particularly poignant moment towards the end of the show that didn't quite carry across and I feel bad this was the case. I also felt that the "love team" of Mimi and Carlo wasn't all that felt in terms of their performance, but this may also related to their limited time on stage together. Individually I loved the character of Mimi but she didn't see to play well off of Carlo. There were some bits of physical comedy that felt a little rushed or were completed but not properly "celebrated" to show the joke landing. Some really good bits were diminished since there seemed to be an urgency to move to the next scene or have the characters exit to meet a next stage cue or something along those lines. TL;DR: A Comedy of Tenors is a strong opening to the season and a great play overall that was a lot of fun. I expect a lot of folks to enjoy this sort of more accessible theater and they really should given the good work Repertory does for local theater. Thus the play gets a full 5 crazy misunderstandings that bring the farce to climax out of a possible 5.